Note: You can enter this giveaway one (1) time per e-mail address per day. Deadline is 11:59PM ET 1.1.19. 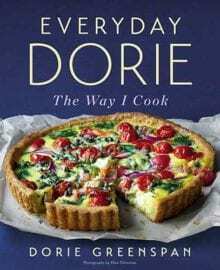 Dorie Greenspan has hundreds of thousands of social media followers who eagerly await her next recipe., tip or suggestion. With her latest cookbook, she invites us into her kitchen and shares the recipes she makes all the time. Each recipe has a special surprise that is uniquely “Dorie” from mustard and walnuts in cheese puffs to cannellini beans in cod en papillote. Every dish is made with common ingredients and perfect for serving family on weeknights or guests on special occasions. Don’t believe us? Try this recipe for Spaghetti and Meatballs; it’s Dorie’s take a classic. NO PURCHASE NECESSARY TO ENTER OR WIN. Void where prohibited by law. Open to legal residents of the 50 U.S., D.C. and Canada (excluding Quebec) who are at least eighteen years old at the time of entry and have internet access. Begins on 12.11.18 at 12:00 a.m. ET and ends on 1.1.19 at 11:59 p.m. ET. To enter this giveaway, submit your full name and email address on this form. Odds of winning this giveaway depend on the total number of eligible entries received. Only one (1) entry per email address per day. Sponsored by Leite’s Culinaria, Inc. For more information, visit our Official Rules. For a list of winners, check out our Very Happy Winners page. Be sure to add giveaways@leitesculinaria.com to ensure notification if you are the winner.